And yet Emilie Charlotte Le Breton, the clergyman’s daughter from the Channel Islands, became one of the most feted British actresses of the time. 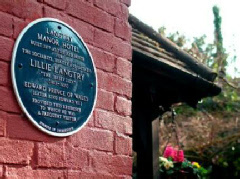 She is, of course, better known as Lillie Langtry: star of such plays as The Degenerates. But it is more for her long-standing affair with the man who would become King Edward VII for which she is most famous. Infatuated by Lillie, Edward purchased a plot of land in the quiet area of Bournemouth’s East Cliff where she could oversee the building of their very own country retreat - the foundation stone bears her initials and the date 1877. The house is almost exactly the same now as it was then: The King’s chamber with its high ceiling to disperse cigar smoke; the large doors of the Langtry Suite to accommodate the wide dresses; the spy-hole above the dining hall where the future King would survey dinner guests before deciding whether to descend; and the Minstrel’s gallery and its tongue-in-cheek inscription “They say What they say? Let them say”.